This academic program is a trans-disciplinary examination of a fragile state in transition. Participants learn about postwar state reconstruction, social reconciliation, and peace building through analysis of international humanitarian law, transitional justice paradigms, trauma theories, and the role that religion plays in the escalation and cessation of violence. 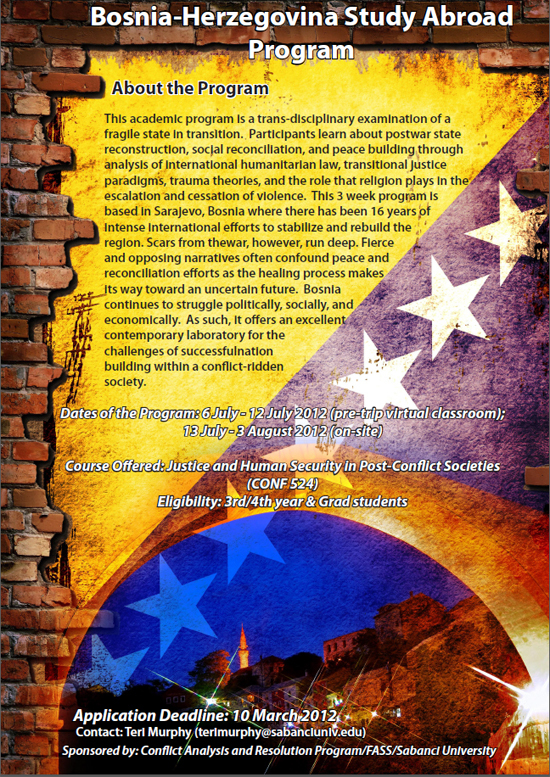 This 3 week program is based in Sarajevo, Bosnia where there has been 16 years of intense international efforts to stabilize and rebuild the region. Scars from the war, however, run deep. Fierce and opposing narratives often confound peace and reconciliation efforts as the healing process makes its way toward an uncertain future. Bosnia continues to struggle politically, socially, and economically. As such, it offers an excellent contemporary laboratory for the challenges of successful nation building within a conflict-ridden society. *Open to upper level undergraduates and graduates from all academic disciplines.